NVM was my first full marathon I ran last year 2013 via FleetFeet's Marathon Training Program and you never forget your first. I believe I finished in 4:36 and literally thought I was going to collapse right at the finish line - had nothing left. Somehow I managed to drag myself to pick up the sweat bag in the Gym and have an ice cold shower. The High School cafeteria had HOT minestrone soup and break which was just what I needed to restore some life back into the shell that was remaining after the race. with caramelized bananas. Expensive fun, but very pleasant way to start the weekend. One of the reasons I like SpringHill Suites, even though it is ~10 miles from where the buses leave at 5:00AM to take you to the start line, is that the Hotel is freshly remodeled, has 1PM checkout for Runners and starts providing breakfast for runners at 4AM! Many people complain about it's location being remote and far from restaurants/bars, etc but for a Runner the place is excellent. When we got back from dinner, I had a swim in the pool with my son, then settled in for the night. The next morning my wife and I got up at 4AM to hit the breakfast (Toast, Bagel with butter, coffee) then my wife dropped my off a half mile from the high school and I walked to the buses (by 5AM). Talked with many runners in the bus line and saw a few familiar faces on the bus. It's great that NVM still limits this race to less than 3000 and only marathoners. After drop bags were dropped off we had time for a group shot minutes before the start. Nearly all the runners you see did NVM last year and this was our second or more together. The weather was perfect for running : cool 55 deg, overcast, slight breeze and mist but no rain. Couldn't have asked for better weather. The course itself is net negative but there are plenty of rolling hills especially for the first half. 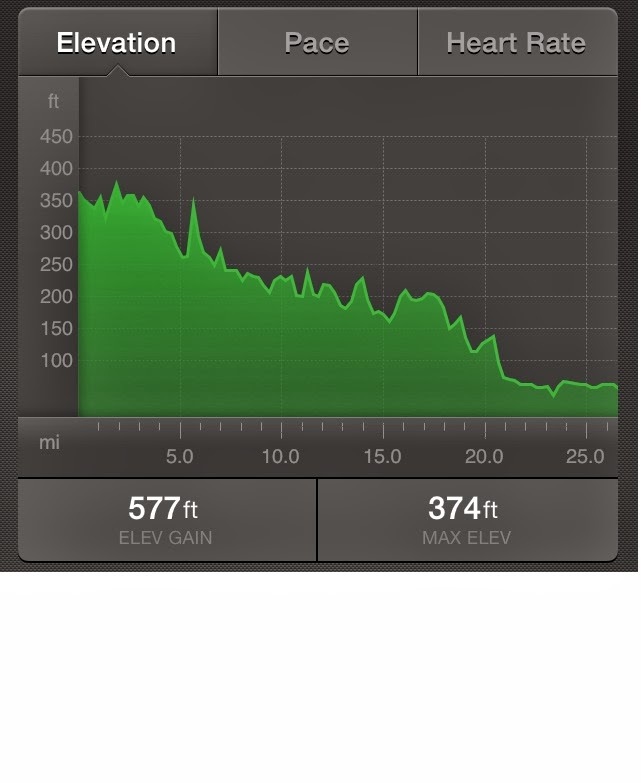 You can see my recorded elevation profile below from iPhone5->Strava. You could say it is similar to CIM but NVM has more rolling hills. 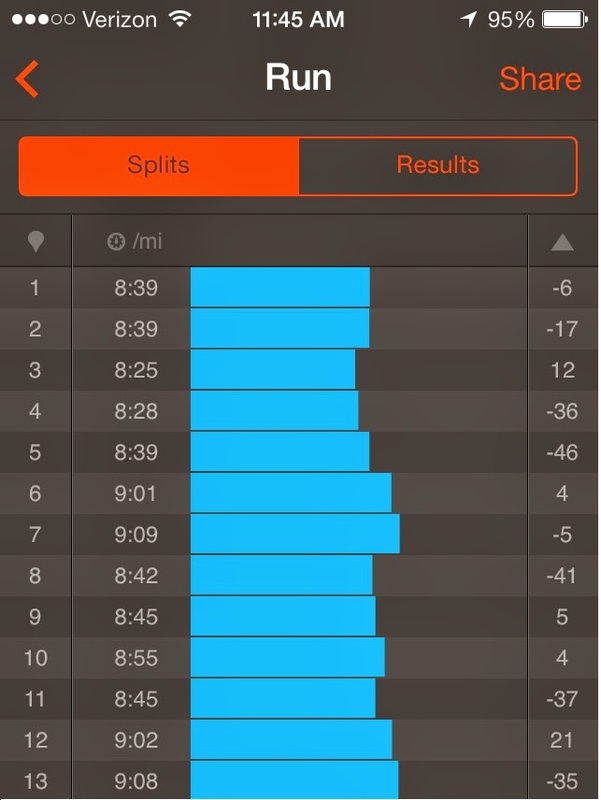 My race strategy (this time) was to go out no faster than 8:30 min/mile for the first half, then no slower than 9:30 min/mile for the second half : average being 9 or 4 hr target finish. 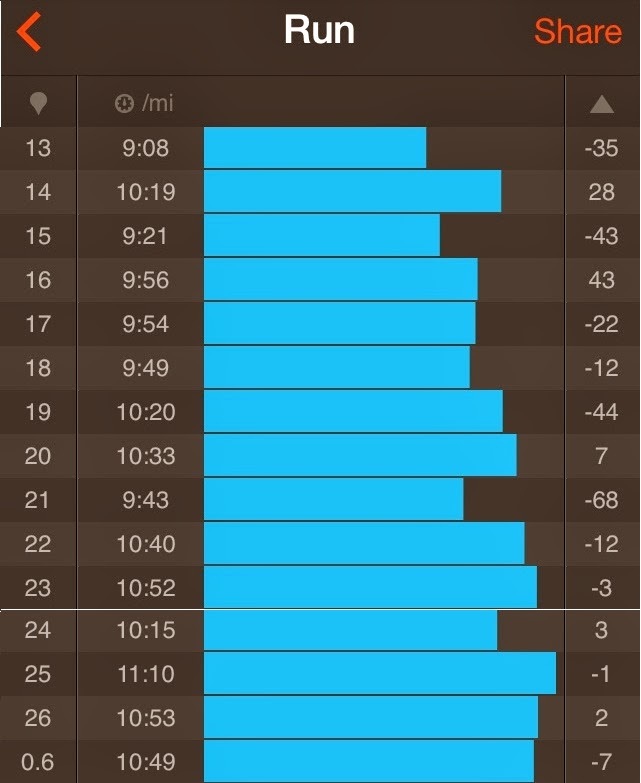 My first half pace was close at 8:45 min/mile. One unforeseen complication was a hotspot that developed on my right pinkie-toe because I didn't put the shoe insert flat. User error. However, I just stopped a couple of minutes to take my shoe/sock off, wrap the toes in band aids, recenter the insert, then back to the road. Whilst I was doing my shoe readjustment a fellow runner who just completed the Lake Chabot 50K a week before caught up with me! Steve had no goal time whatsoever and was just running to recover and for the fun of it. Here is snapshot by the FleetFeet Race Team capton of me at mile 20. There were also some howling wolves in the mountains to help keep us motivated past half way mark! How did the second half go you ask? My target pace for second half was no slower than 9:30 min/mile; however, what I was actually able to do was a sluggish 10:19! The second half is mostly downhill with the finish winding through neighborhood streets, so I can't blame 'the hills'. It did start to sprinkle but not enough to interfere with running. I was taking one GU every half hour with MD/water so my fuel/fluid was pretty much constant through out. I simply 'bonked' again during the second half. I now have a mentor/coach whom I'm working with 1:1 to figure out a better training and nutrition plan to help me handle the second half and my quest to run sub-4 marathon. Official finish time was 4:17:41 which was 18 minutes off last years race and 3 minutes off CIM. I really cannot complain about this years race nor effort. Was a very fun race spent with many friends and family.